Olivia's athletic origins lie in gymnastics and circus arts. 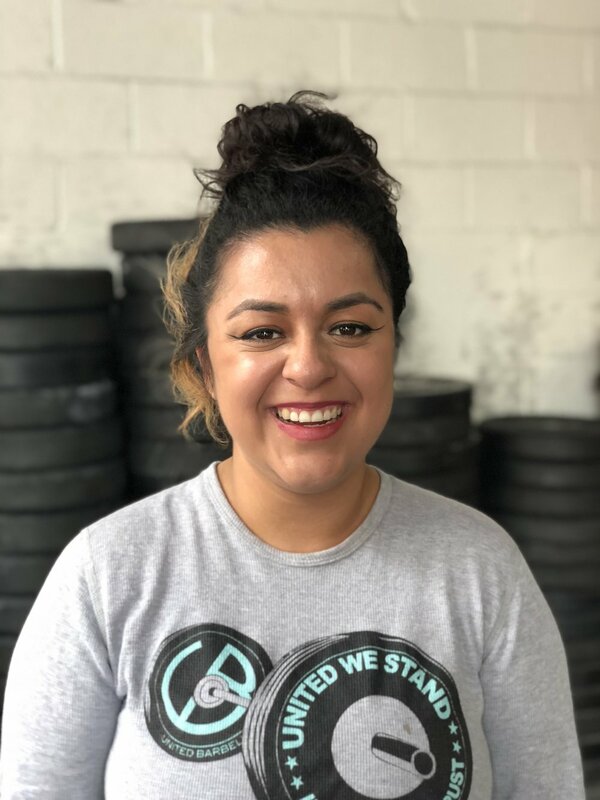 After finding CrossFit in 2007, she became obsessed, and three years later left her IT career and opened United Barbell. Olivia is particularly passionate about helping people who are new to fitness find joy in their growing athletic abilities. Since the birth of her daughter in 2013, Olivia can add helping little ones find their athletic path to her list of passions. Olivia is a cyclist and is currently focused on training for the cyclocross season and the 2019 Death Ride. Jason has been CrossFitting for nine years and joined United Barbell after he moved to the city in September 2012 transferring from CrossFit Milpitas. A former Cross Country and Track Runner, he remains a competitive athlete with his first competition being the 2008 CrossFit Games and has been diving into local competitions as well as entering in The Open every year. Outside of the gym, Jason is a Wellness Ambassador at AOL where he coordinates healthy office programs and also provides one on one coaching for high-performing individuals who seek to overcome plateaus in certain areas of their life whether it be eating, exercise, sleep, stress or more. He's committed to helping clients grow into their full potential to lead fulfilled and driven lives after having overcome corporate burnout himself. Jack is a former Marine whose passion for fitness took him from his career as an EMT into a full time CrossFit coach. Jack discovered his love of CrossFit when using it to train during his military career. After spending a period of time "bro-lifting," he discovered he needed a more well-rounded training methodology and returned to CrossFit after being inspired by CrossFit Games athletes. He enjoys petting dogs, drinking coffee, and living his best life. Dave was a high school distance runner and tennis player. Ironically, he does neither of these sports anymore, and is a dedicated competitive Olympic weightlifter. His current goal is qualifying for the American Open. While in grad school, Dave discovered CrossFit after getting a coupon handed to him. He joined United Barbell as an athlete in 2012 and fell in love with the community, making UB his home away from home. After completing much of his CrossFit certifications for his own personal development, Dave decided to embark upon UB's internship program and become one of our resident Oly coaches, moonlighting as "CrossFit Dave" once year during the CrossFit Open. Liran is a former Israeli Defense Special Forces soldier who was involved in sports - so when he found CrossFit, it was a perfect match! Three years after he started CrossFitting he left his engineering career to become a full time coach. Liran specializes in gymnastics, but enjoys keeping a well rounded program through CrossFit. His goal is to help athletes move better and feel comfortable being uncomfortable. Jackie is an SF native and former cheerleading athlete who sidelined her fitness until she discovered CrossFit. At first she was intimidated but with the support of her co-workers is now proud to call herself a CrossFit athlete! In her spare time Jackie enjoys visiting art galleries, museums, traveling, and always living her best life.